Islamabad: A young girl from Pakistan has proved that disaster and disability can be overcome by passion, optimism and resilience. Insha Afsar, 17, lost a leg in the 2005 Kashmir earthquake, when her school collapsed during the 7.6 magnitude quake that killed around 80,000 people and displaced millions. But disability has not held her back as she is determined to conquer the icy mountains on one leg. Afsar has risen to become a champion one-legged skier from Pakistan. 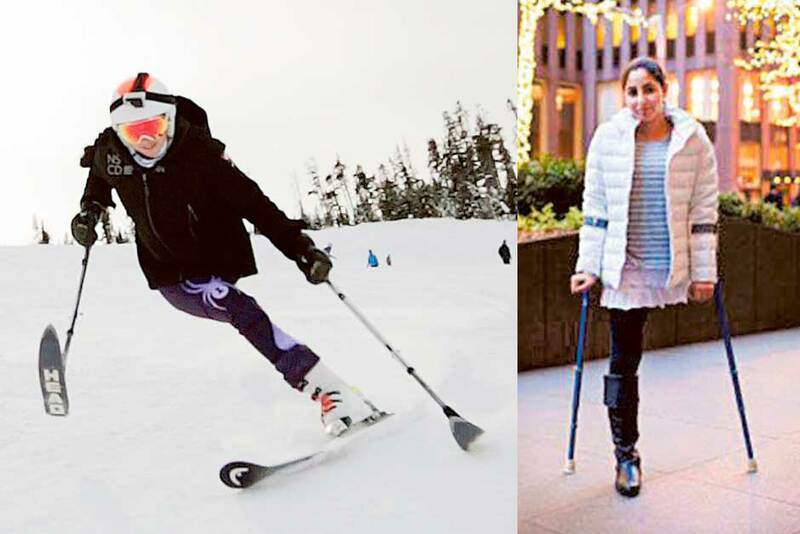 She hopes to represent the country at the upcoming 2018 Paralympics in South Korea — perhaps as Pakistan’s first ski racer. “I’m a person that likes going fast, doing everything fast. I just like speed,” Afsar said sharing her dream of skiing at international level. Hailing from the northern region of Pakistan, just north of Muzaffarabad, where few women participate in any such sports, Afsar is indeed a trailblazer. “It’s not common for women to be athletes [in Pakistan]. Now I’m doing a sport that I love. That might inspire people despite everything that’s holding them back,” said Afsar. She has found a way to make her dreams come true in United States, empowered by her parents in Pakistan and supportive host parents, Ted and Rebecca Bent in the USA. The young Afsar first travelled to the US six months after the quake, to be fitted with a prosthetic leg, after TIME magazine photographed her and one of the editors offered to fly her to America. During a medical visit, Ted and Rebecca offered to accommodate her and send her to school. Afsar was fitted with prosthesis but prefers her new lightweight crutches that allow her more mobility. Since then she has competed in several NASTAR races and participated in the Hartford Ski Spectacular in 2013 and US Paralympic Alpine National Championships in 2015. This inspiring Pakistani girl now studies at Berkshire Academy in Massachusetts and is an athlete sponsored by the New England Disabled Sports. Afsar skis with Berkshire’s ski team in the winter. During her vacations, she spends time at training camps all over the US. Pakistan currently does not field a team for the winter Games. Afsar, however, is determined to compete and win as a Paralympic athlete from Pakistan. In future, she also plans to mentor other athletes who have the same big dreams. “Don’t be afraid of falling,” she says. “Because you can always get back up” is her message for everyone struggling out there.